What makes Lagunita Lake House special? THE VIEW!! Right on the water!! It has Charm!! THE HOT TUB!! Book It now!!! The cabin was originally built in 1930; you can still see the logs they used to support the roof and the beautiful quartz fireplace that is the focal point in the cozy living room. It was updated in the 90's and received a fresh coat of paint last summer. There are actually 5 buildings on the property: Main Cabin, Bunkhouse#1, Bunkhouse#2, The Boat House,and The Garage. They all have a lot of charm and quaintness in their own way and they all have a Lakeside view. The most unique feature of 'Lagunita' is definetly the setting...It sit's upon a beautiful little lake in the heart of the Sierra Nevada...surrounded by old growth ceder, pine, and madrone trees. There is a waterfall on the right side of the cabin that run's year round, imagine yourself relaxing on the deck or in the hamock with the tranquil sound of the water steadily washing over the falls. A few steps off the back deck and your at the lake fishing, swimming,or paddling in paradise. What's to do? : If you love nature you will love this place. There are lots of options to keep you occupied or you can just relax down on the dock, in the hammock, or on the deck. If you like to stay busy well you can:Go rafting, fishing, biking, gold panning, jeeping, hiking, horse back riding, wine tasting, moto cross riding, gambling, skiing, bird watching, antique shopping, or check out the local festivals .There is always something to do and see. Children, The Grand-babies....and The Great Grand-babies. Lagunita is perfect for a gathering of friends: Any or all, big or small, I'm sure who you pick will be perfect. When to come? : Winter: Sitting at 3500 elevation it can be cold with snow on the ground..like a winter wonderland. Spring: Cool with the sun filtering through the trees and a nice cool breeze. Summer Or: Warm but not hot with lots of shade from the trees. Fall: Crisp with the change of colors and the sun glimmering on the water. Anytime: The panorama is visually beautiful! Come & Enjoy you won't be disappointed! Our cabin has the best view of the lake from our deck and property. Our garage is located across the road on Homewood Dr. It is used mainly for storage. Very large wrap around deck for outdoor living. Kitchen also has : Crockpot, lg. Skillet, Espresso Maker, Waffle Maker, Mixer, Air Popcorn Popper Deck also has :2 picnic tables and outdoor sectional couch & hammock's. Thank you for the nice review! We are so happy you enjoyed our Lake house. Looking forward to having you back in the future!!! Very nice accommodating well supplied home in some of the most serene, beautiful locations you would hope for. I can not think of a better place to stay and enjoy watching the storm of the season this year roll through the area. Thanks for letting us stay once again and as always already looking forward to next year. We are so happy that you & your crew enjoy your yearly trip to our cabin. We love having you! See ya next year. We had a wonderful time at Lagunita. Upon arrival, everything was where the owners said they were. We turned on the water and water heater, had no problem getting in, and was moved in right away. Had a wonderful time visiting with our great grand kids. We had lots of room and beds. Lots of kitchen items and appliances to make it easy to make a meal. If we needed anything, store was close by. Over all, great. Park in areas designated. I am on dialysis, so I had to travel back to Auburn to get treatment, but it's only an hours drive and the Auburn clinic (Davita) was great. Even with disruption, we still had an enjoyable time and would recommend it to everyone. Owners were very helpful and friendly, if you need to contact them. While we were there, owners put in a new washer and dryer. Again, this is a perfect vacation spot. Kids went for lots of walks and enjoyed themselves. The cabin and surroundings exceeded our expectations. The area is very peaceful and quiet. The extra bunk houses afford plenty of extra beds and space for larger families. The house is great. The two bunkhouses gave our kids room to spread out. Lake is very nice, although we were there in the winter so water sports were not an option. The kitchen is well provisioned with all the utensils you could need. My only concern is that the double bed mattresses were not great, they have soft toppers and fitted sheets that won't stay on the bed... otherwise, this was a very comfortable, clean and enjoyable place to stay. We would like to come back in the summer. Lagunita Lakehouse is truly a must see. The cabin is very beautiful, clean and cozy. We loved everything about it and will definitely return in the very near future. …or just love to relax, you will love 'Lagunita Lake House'. In the heart of the best river rafting in the state, Lagunita is located below the western slope of the Desolation Wilderness Area, and near countless recreational resources. There are miles of trails for hiking, horseback riding, mountain biking and ATV and dirt biking. Please note: you may not ride ATV's or dirt bikes in our small community of Chiquita Lake, but there are many trails near by. 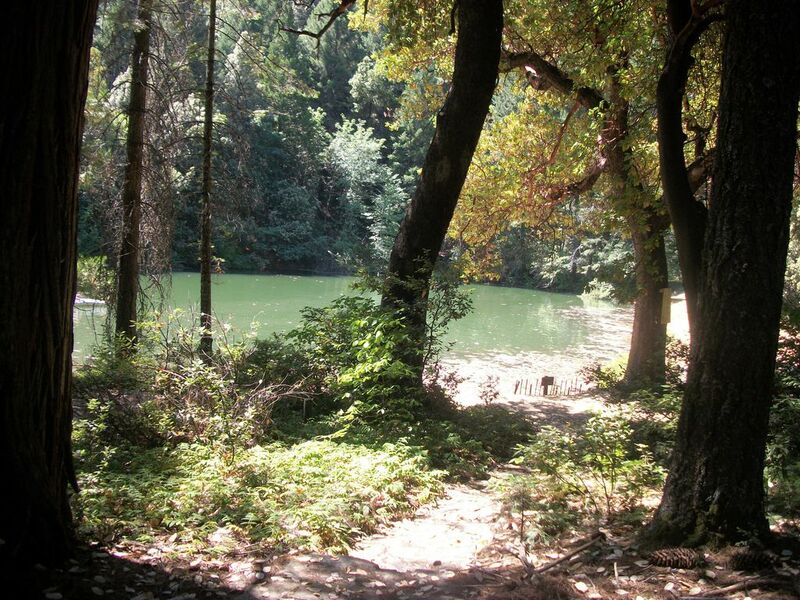 Lagunita Lake House is nestled within a small community of approximately 18 cabins, and is an easy 10 - minute drive to town for groceries. Lagunita is set up nicely for two families to enjoy. Our cabin accommodates up to 12 people with 5 bedrooms in total between the cabin and bunkhouses. The main cabin has 3 bedrooms, 2 baths. We also have two adorable rustic bunk houses for extra sleeping quarters. The main cabin has a big deck to enjoy the stunning view! We are confident you'll want to make this unique setting your yearly vacation getaway! Rates: PLEASE KEEP IN MIND: We do not have any hidden fee's. We do not charge extra for more guests after 4! We do not charge more for weekends! We are a flat rate of $225.00 for up to twelve guest and It includes all 3 cabins! Sept. Thur May Nightly $225.00. 2 night minimum (not including holidays) Summer: 7 nights: $1575.00 rental fee +$150.00 cleaning fee + taxes $157.50 = $1882.50 * plus Homeaway will add a fee of 6 % to 12%. depending on length of stay. June, July, and August we rent our cabin weekly from Friday to Friday. * You can still book a week and come on the days you want during the week you have booked for 12 people it is still very reasonable!! !